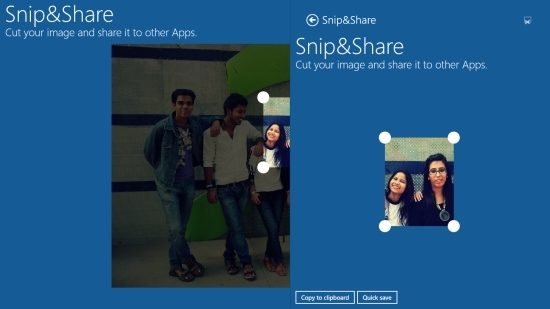 Snip&Share is a free Windows 8 Image Editing app that lets you crop and share your images easily. With this free Windows 8 Image Editing app, you can crop images from different sources and share them through mail or through some other supporting app. It is a simple Photo editing app with a user-friendly interface. Not packed with too many functions, the app simply lets you browse photos on your system and crop them the way you want. You can select an output folder destination to save these cropped images or share them with others. The app supports jpg, jpeg, png, and bmp file format. You can select any of these formats to save the cropped image on your system. Snip&Share is freely available in Tools category of Window s Store. You can search for the app in Windows Store using Win+Q key combination or click on the link given below at the end to view it directly in Windows Store. Let’s see how this free Windows 8 Image Editing app works. To use this Free Windows 8 Image Editing app, you will first need to install and launch the app on your Windows 8 system. 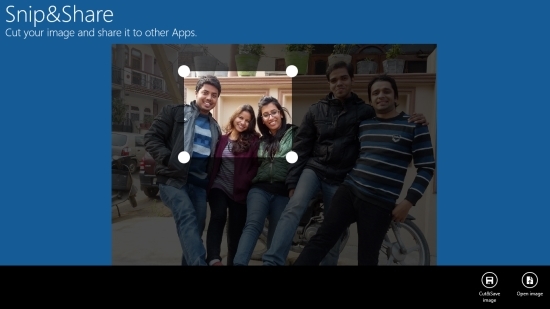 The Start screen of the app will display option to browse and select the desired image file that you want to crop. Once the desired image file is selected, it will display on the app’s screen. Use the pointers on the corners of the selected image to crop image. Now, right click on the screen. The app bar will display Cut & Save Image, and Open Image option. To save the cropped image, click on Cut & Save option. Select an output folder destination where you wish to save the cropped image, type a name, choose a file format in which you want to save the cropped image using the dropdown, and click on Save. 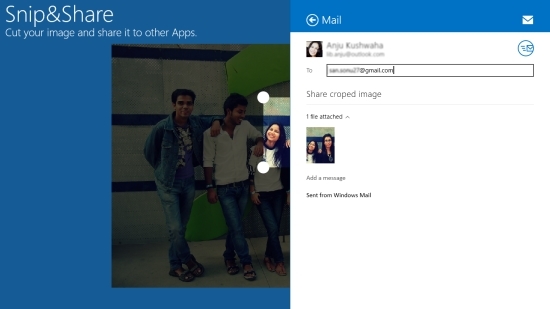 You can share the cropped image using the Windows 8 Share charm, via e-mail. The app also allows you to copy the cropped image to your clipboard or quick save it directly to your Pictures library. Also check Crayola Photo Mix & Mash and PicLabs. 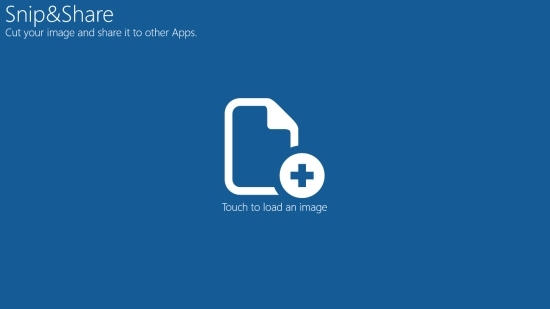 Snip&Share is a simple Windows 8 Image Editing app with minimalistic features. Using this app, you can quickly crop images the way you want and save/ share them easily. Give it a try and share your feedback via comments.